Volume I of the Floodgate Poetry Series does not disappoint. It offers all of the advantages of the chapbook with the added spark of three voices placed side by side, so that the poems of one poet linger and influence the reading of the next. This is the first volume in the Floodgate Poetry Series, an annual series of books collecting three chapbooks by three poets in a single volume, edited by Andrew McFadyen-Ketchum. Chapbooks—short books under 40 pages—arose when printed books became affordable in the 16th century. The series is in the tradition of 18th and 19th century British and American literary annuals, and the Penguin Modern Poets Series of the 1960s and ’70s. Campbell McGrath’s Picasso/Mao is a short collection of poems told from the point of view of the two historical figures, spanning seventy-five years of history. McGrath is the author of twelve collections of poetry, and has been awarded Guggenheim and MacArthur “Genius” Fellowships. He is the Philip and Patricia Frost Professor of Creative Writing at Florida International University. Jenna Bazzell’s Homeland describes a troubled family life, beginning with a drug deal gone bad, redeemed by time and the pleasures of the natural world. Bazzell won the 2010 AWP Intro Journal Award and an Honorable Mention from the Academy of American Poets Prize for poems included in the collection. Martin Anthony Call’s The Fermi Sea explores a near future of urban decay, nanobots and holograms against a backdrop of lost love. Call earned his MFA in Creative Writing from Southern Illinois University at Carbondale in 2008. I’m struck by the distinct differences in each collection, and yet how the volume somehow holds together as a piece in itself. Overarching themes of history (both personal and political) woven through with glimpses of the future run through the collection. . . Volume I of the Floodgate Poetry Series does not disappoint. It offers all of the advantages of the chapbook with the added spark of three voices placed side by side, so that the poems of one poet linger and influence the reading of the next. This collection of chapbooks offers the reader a startling variety. Bazzell’s Homeland is a compelling blend of narrative coherence and lyric lift. The opening poem, “Bubba Pub,” offers us the DNA of her entire chapbook: poems anchored in place and relationship. The poem describes a drug deal the speaker goes on with her mother, and a line like “the long O of a gun barrel tunnels back to the torso of a man” both shows the horror of being robbed during the interaction and “how suddenly night takes on strangeness.” It has been said that literature should either make the familiar strange or the strange familiar; Homeland does both with alacrity. The Fermi Sea, by Call, explores a distinctly 21st-century theology, one where the Holy Ghost is turned holographically into the Hologhost. And Call makes use of poetic puns throughout his chapbook, all of which are charmingly and even philosophically attractive. And, finally, in Picasso/Mao, McGrath opens up history, art, and politics to the purview of poetry. The unlikely pairing of these two figures allows for many unexpected and exciting overlaps and divergences. Campbell offers us entry into the minds of his poetic subjects in persona poems that delight with their ambition. 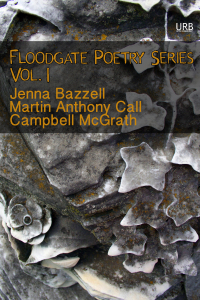 Floodgate brings together three poets of stunning range and ability. Moved to praise Jenna Bazzell’s poems, one could say they transcend the subject of a family relationship. But what the poems really work so ardently to do is stay—rooted in their rich Southern landscape, and true to the woman they remember. Continually uncovering new angles for approaching her lyric narrative sequence, Bazzell closes each poem with such well-crafted care that, turning a page, the reader is both surprised that more could follow and drawn further into material so deeply felt it will never be finished. Martin Anthony Call’s character sketches in The Fermi Sea call to mind a dystopian Spoon River Anthology set somewhere mid-twenty-first century on the West Coast. Filled with nanotechnology, all-digital media, walled cities, holograms, and air cabs, these poems project a gritty disillusionment about the power of both humans and machines. (Think more Blade Runner than Star Trek.) With deft poetic strokes, Call introduces the reader to a host of characters whose trials have only just begun. Martin Anthony Call pairs a dystopian vision with formal craftsmanship and narrative intricacy. Fusing the old world with the next world, The Fermi Sea is an elegy for the present, a portrait of perception in which the real is always a step ahead and certainty is a rumor that no one cares to repeat. Haunting and urgent, Call has found a line and a music as arresting as it is gratifying. A remarkable collection! In Picasso/Mao Campbell McGrath perfects the persona in a series of historical poems that span seventy-five years. While the founder of Cubism decries “the idiocy of war,” the founder of the Red Army draws an egg, failing a class in life drawing. Ample, dazzling, and elegantly crafted, these poems demonstrate a great mind enacting other great minds. Oscar Wilde once wrote, “A mask tells us more than a face.” These McGrath poems tell us much more than biography—they demonstrate cultural shifts and perception, a sophisticated and compassionate worldview, the poet’s intellect shining through. Campbell McGrath brings music to his epistolary poems centered on Mao and Picasso, their deeply lyrical voices a resistance to “the sugar-coated bullets of bourgeois entitlement,” their obsessions revealed by each “owning nothing, [but] having staked everything.” These poems are divergent elegies to lost loves, Mao to his war, Picasso to his art, and McGrath is the expert historian, translator, creator of “art [that] is not documentation, but transformation.” I was transformed by these poems, and transfixed, twisted, torn asunder, rebuilt, reformed, and awe-struck. You will be too. And Mao? McGrath teaches him to sing like a poet from his “Hall of the Wealth of Books.” And Picasso? McGrath paints him, “to stave off death.” And fearsome, the knowledge that McGrath just continues getting better. Entry filed under: Poetry. Tags: Campbell McGrath, Floodgate Poetry Series, Jenna Bazzell, Martin Anthony Call.